Home > Mind > Can Tinfoil Hats Keep The Government From Reading Your Mind? In ‘Signs,’ they prevented alien telepathy. But what about the NSA? Before M. Night Shyamalan lost most of his Hollywood street cred, he released 2002’s alien thriller “Signs.” The movie (however poorly it’s aged) was a huge success at the time. I take no issue with the plausibility of crop circles, an alien invasion or the earth’s eventual salvation being — surprise, surprise — water. 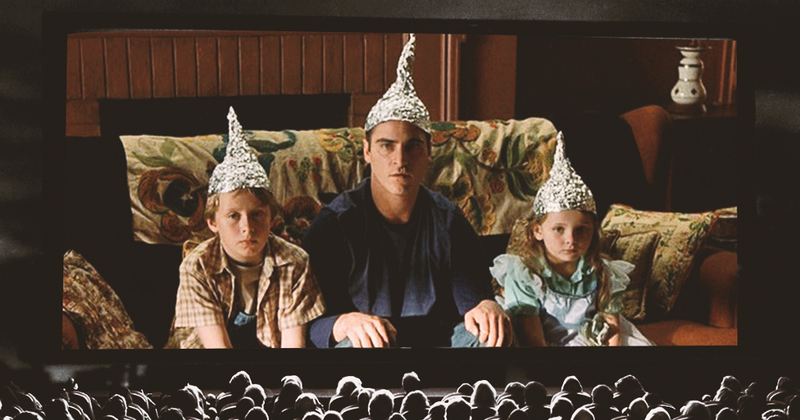 I’m more interested in those goofy tinfoil hats Joaquin Phoenix’s character and his kids don as makeshift defenses against the aliens’ telepathic intrusion. Would a little metal chapeau do anything to guard against an extraterrestrial brain-assault? Or — keeping in mind the NSA’s enthusiasm for clandestine monitoring — the more pertinent question might be whether those caps would guard against governmental mind reading. From there, tinfoil hats became synonymous with conspiracy theorists and paranoid kooks, particularly of the sci-fi variety. Turns out, however, the wackos might be doing the hat thing all wrong. Soniak references an MIT experiment to determine the efficacy of tinfoil hats in deflecting potentially evil radio waves. Their conclusion? The aluminum headgear did deflect many known radio waves, but actually amplified those in the range which transmit mobile communications, broadcast satellites (for TV) and flight navigation. In other words? Those protective caps are actually giant antennae allowing any manner of alien (or government) to invade your brain. Go figure.